The sunshine in Florida mostly shines throughout the year. Although there are a lot of ways to deal with this sunny weather, installing an air conditioning system is one of them. However, bear in mind that when dealing with the sunny weather in Florida, you need the best air conditioner to keep your home cool and comfortable. In this article, we will provide great guides that will help you choose the right AC unit for your home in Florida. Buying an air conditioner system for your home is a worthy investment in this part of the world. Furthermore, before to head to get an air conditioner, first check out the best brands in the market. The air conditioner you choose should be able to keep your home fresh and comfortable all year round. Although there are different types of air conditioning units to choose from, knowing the best brands is a good thing. This decision will go a long way in helping you get the best product in the market. A lot of thinking goes into shopping for an AC unit for your home or office in Florida. All air conditioning units might have different cooling capacities, and price but they all serve the same purpose. Many air conditioners are flooding the market with great features, designs, and efficiency. For this reason, there are important things you need to consider to make your purchase worthwhile. Below are the things to keep in mind. The cooling capacity you will need in an air conditioner all depends on the room size you plan use it. A small room wouldn’t need an air conditioner with a high cooling capacity. On the other hand, larger rooms will require great tons of AC. Thus, before buying an AC for your home or workplace in Florida, you should first consider the capacity. To get the right cooling capacity that will work great in your room first determine the square footage of the room. You can get this by measuring the length and width of your room them multiplying both together. For you to save more on energy cost, this depends on the type of air conditioning unit and the features it comes with. When buying your first air conditioning unit, ensure to pay close attention to its energy efficiency. HVAC systems come with a standardized energy efficiency rating. Air conditioning units with more energy stars are more likely to use less energy when compared to those with a low rating. Many do ask “what type of air conditioner I should buy?” Well, this doesn’t have to be a tough decision. As you should know, all air conditioners serve the same purpose. The window air conditioner is pocket-friendly, but Split offers a nicer air dispersion. The portable types are also great – you can move it easily from one place to another within your room. Also, you don’t need to break the bank to get this – affordable and energy efficient. With this said, consider the type that will suit your need and will work great to keep your home cooler and fresher. The air quality in your home matters a lot. Most air conditioner comes with a great feature to keep your home comfortable and to make your indoor air breathable. Air conditioner with dehumidifier will help to remove excess moisture, making it pretty hard for allergens to thrive. Getting an air conditioner with this function will help to improve your indoor air quality. Most people do not know the importance of a proper AC installation job. Your AC will only work great when it is installed properly. Thus, never leave your AC installation tasks in the hands of amateurs, but hire the services of a professional. Also, maintenance is very important. Always check and clean your AC from time to time, as this will help deter future breakdown. Air conditioner units that run smoothly and quietly are what every buyer should be looking consider. The cooling speed is also a must-check, as this will help provide you with what you need. However, air conditioning units with two fans will make things easier for you. If you wish to spend more on AC units, then buy one with a sleep mode and auto restart feature. The pioneer WYSS012-17 is a super-great air conditioner. This AC comes with a lot of exciting features. It has a powerful cooling capacity and runs quietly. This advanced model comes with a wireless remote, giving you more comfort while controlling the unit. With a pioneer WYSS012-17, you can cool or heat your home efficiently. It can also work as a dehumidifier to help remove excess moisture. This ductless AC unit also comes with a night mode and auto restart function for better efficiency. This powerful and energy efficient EDGE STAR air conditioner comes with an exciting feature to meet all your cooling needs. This portable air conditioner has a cooling capacity that can cool up to 425 Square feet room efficiently. It also comes with a filter that is specially designed to remove harmful airborne allergens from indoor air. With its energy saving feature, this product will reduce your energy cost. It has a seasonal versatility function which supplies both cold and hot air. The best part is that it can help reduce humidity level in your home as it has dehumidifier function. Overall, it is easy to maintain and can work great in fairly large size room. 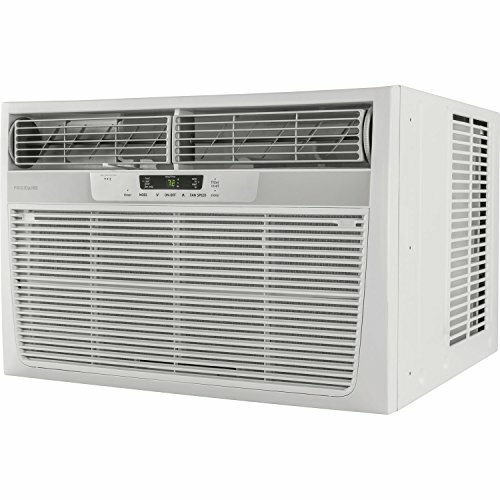 The Frigidaire FFRH1822R2 18500 BTU 230V Air Conditioner works perfectly for a room that measures 1,050 square feet. This portable air conditioner comes with a slide-out chassis designed for either a wall or window installation. It has a high cooling capacity and also comes with wireless remote control. To add to its many features, this versatile AC leaves also has a heater function. It operates quietly and can keep your home cool and comfortable on a sunny day all year round. Other features include an 8-way air direction control, electronic control, and multiple speeds. It also comes with a washable filter that helps to reduce room odors, bacteria, and airborne particles. Best for users that want to make their home or office cool and comfortable. An air conditioner makes your home a healthier and fresher place to live in. Although there are many types of air conditioners to buy, always do your homework carefully before buying one. Also, it best to go for the best air conditioner that has the best reviews.